Rigger boots take their name from the fact that such boots used to be standard issue for workers on North Sea offshore oil rigs. Given that offshore oil rigs are amongst the most demanding and hazardous of all working environments, workers needed the sort of boots that they could truly depend on. 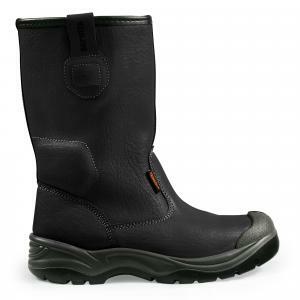 As such, nowadays you will struggle to find more comfortable, versatile, and effective safety footwear. When designing our rigger boots, we took inspiration from the high street. So not only will our rigger boots keep you safe, and enable you to get the job done, they’re also significantly more stylish than most other available safety footwear. Our rigger boots are available in a choice of two styles – striking black or a timeless earthy brown. Our rigger boots feature an S1P SRA safety rating. This means that the reinforced toe can withstand 200J impact and 15kN compression force, and that the seat region can withstand forces of 20J. They offer up to 1,000 MegaOhms of electrical resistance between foot and ground, and the outsole is penetration resistant to forces of up to 1,100N. On top of that, having been tested on tiles with NaLS lubricant, they are supremely slip resistant – but what would you expect from shoes designed for oil platforms? Anti-slip, anti-static, and with a reinforced steel toe and midsole, our hard wearing safety rigger boots feature a fleece lining, padded ankle support and triple stitched seams. 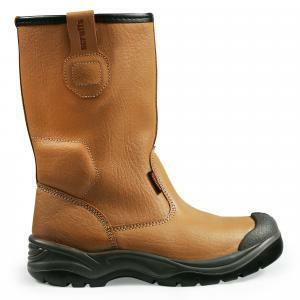 If you work in medium industry or heavy construction, these will offer you all the pull-on protection you’ll ever need. And don't forget to take a look at the rest of our range of safety footwear.